At Girl Scouts, we care about your experience, and we want to hear from you! In April, Girl Scouts of the USA and Girl Scouts of Western Ohio will be conducting several surveys with girls, parents/guardians, and troop volunteers to find out what’s working (and what’s not!) in Girl Scouts. We will use your feedback to improve our services and programs. So, what surveys are we conducting, who will receive them, and what are we looking for? We’re so glad you asked! We want to help all Girl Scouts become confident leaders! To do this, we need to identify what we’re doing well and what girls need to become strong leaders. Every year, GSWO conducts an annual Program Effectiveness survey to see how our Girl Scouts are doing in developing the five leadership skills: Strong Sense of Self, Positive Values, Challenge Seeking, Healthy Relationships, and Community Problem Solving. We also look at how girls are doing with the three process measures: Girl-led, Cooperative Learning, and Learning By Doing. As a council, we use the survey results to indentify what activities troops participate in, develop strategies that support Girl Scouts and Girl Scout volunteers, and learn more about girl and volunteer satisfaction. We report on our Program Effectiveness results each winter. Our 2017 results can be found here. As a thank you, anyone who finishes the Program Effectiveness survey will be entered to win one of several $10 GSWO shop coupons! Who Receives the Survey? We randomly select several hundred girls and troop leaders to participate in our survey. They’re selected from three groups: (1) GSWO Juniors and Cadettes in troops, (2) Brownies, via their troop leaders, and (3) Troop Leaders. How Will They Receive the Survey? Junior and Cadette girls and Brownie Troop Leaders will receive the girl-focused surveys via US mail. Surveys for troop leaders are electronic and will be sent via email. Girl Scouts of the USA conducts a nationwide survey each April to find out what’s working and what’s not on a large scale. There are three separate surveys: one for girls, one for parents, and one for volunteers. In each, Girl Scouts is looking to gather information from each audience about their Girl Scout experience, satisfaction, and the likelihood that they’ll recommend Girl Scouting or volunteering for Girl Scouts to someone they know. As a thank you, everyone who completes the survey will be entered into a raffle to win one of twenty $50 gift cards! Who Receives the Survey? 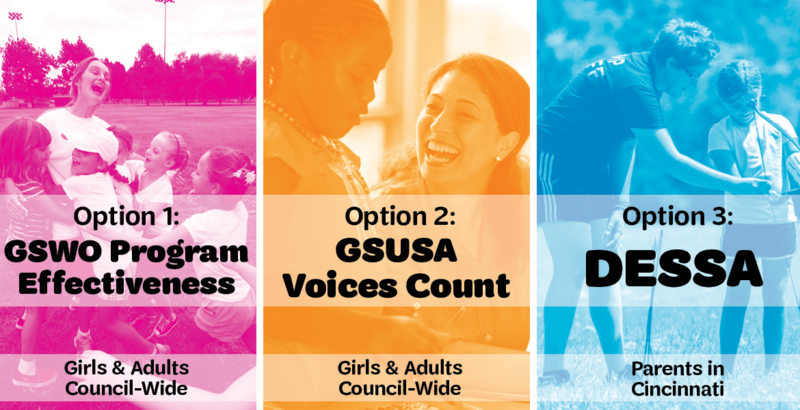 All girls, parents, and volunteers who are members of GSWO (minus anyone receiving the GSWO Program Effectiveness Survey) will receive the Girl Scout Voices Count survey. There is a separate survey for each audience, so households might get more than one — be sure to fill out each separate survey! How Will They Receive the Survey? The Voices Count survey will be sent out electronically by email beginning April 4. Twice each year, as part of our United Way of Greater Cincinnati funding, GSWO collects surveys from parents of Girl Scouts in grades K-8 in the Greater Cincinnati area. We’re looking to see if participating in Girl Scouts affected girls’ social-emotional skill development during the 2018 membership year. In order to see if there’s been any change, we need to do two surveys, one in the fall and a follow-up in the spring. For parents who completed the DESSA survey last fall, we ask that you complete the spring follow-up survey. We aggregate all survey results to see if there’s a significant change across all our girls. We don’t report on individual girls’ results. As a thank you, everyone who completes the survey will receive a discount coupon to the GSWO shop! Who Receives the Survey? Parents of Girl Scouts in grades k-8 in the Greater Cincinnati area who participated in last fall’s survey. If you receive the DESSA survey, you’ll also receive the Girl Scout Voices Count survey, so keep an eye out for both! How Will They Receive the Survey? We will send emails with links to the survey to parents who participated last fall. We can’t wait for you to make your voice count! Keep in mind, you might receive more than one survey! Have questions about any of the surveys you receive? Contact the Customer Care Team at 888.350.5090 or customerservice@gswo.org!